By the end of winter, I'm always at my palest and none of my foundations match me well. There are now several white mixers on the market and I decided to pick one up! Soon after, I got the actual foundation as well. This claims to be an affordable, illuminating, full coverage foundation. LA Girl is now sold at Ulta, Beauty Bay, and in some Walmarts, so it is fairly easy to find in many countries! I bought mine at Ulta for $8.99, not a bad price for almost an ounce of product. Both of these foundations have the same clear plastic packaging with a black cap. You can see the shades through the bottle and it has a pump, which I love. While the packaging definitely isn't luxe, it is sturdy and easy to use. While these two products are both part of the Pro Coverage line, I find that they have different formulas. 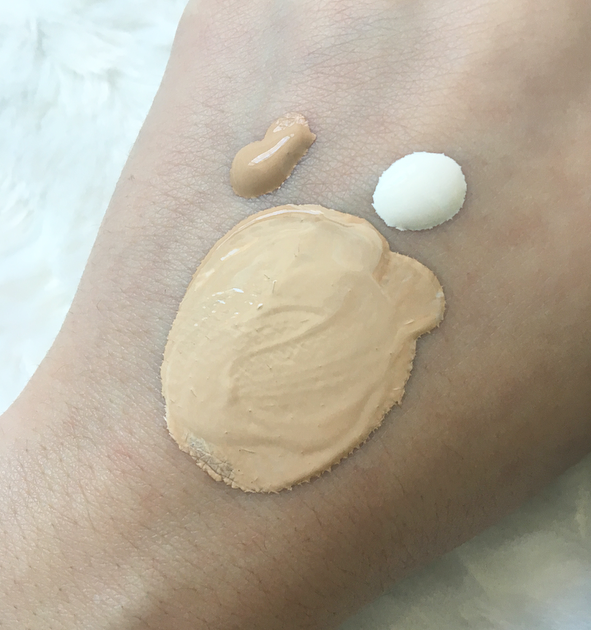 The white mixing shade is thinner and less pigmented, which is obviously meant to make it easier to mix it in with foundations, while the actual foundation is thicker and packs a punch of coverage. I've been using the white shade every single day with a variety of foundations, from my favorite Too Faced Born This Way to the Rimmel Lasting Perfection. It can make a thick foundation slightly more liquid, but otherwise it doesn't seem to change the consistency, coverage, or undertone of the foundation. It's definitely something that I will continue to use and love! I'm not as impressed with the foundation, but it is still a good drugstore option. It has great coverage and is extremely illuminating. If you have oily skin, it will probably be too dewy for you! I have normal/dry skin and still need to set this in a lot of areas. I've noticed that it starts to separate on my T zone after a few hours, even after setting it with a powder. The shade selection is somewhat disappointing. There are sixteen shades including the white option, but I got the lightest shade and it is still too dark for me, perhaps to encourage the sale of the white mixer shade. I'm really glad to see a variety of darker shades, but I wish there were a few lighter options for my fellow pale girls. However, I think Fair will suit me well in the summer and I'll continue to use it, but probably not on 8+ hour days. If you also struggle with dark foundations, definitely check out the white foundation mixer, and if you have dry skin you may love the foundation, too! Have you tried or wanted to try this foundation? Do you have a mixer that you like? 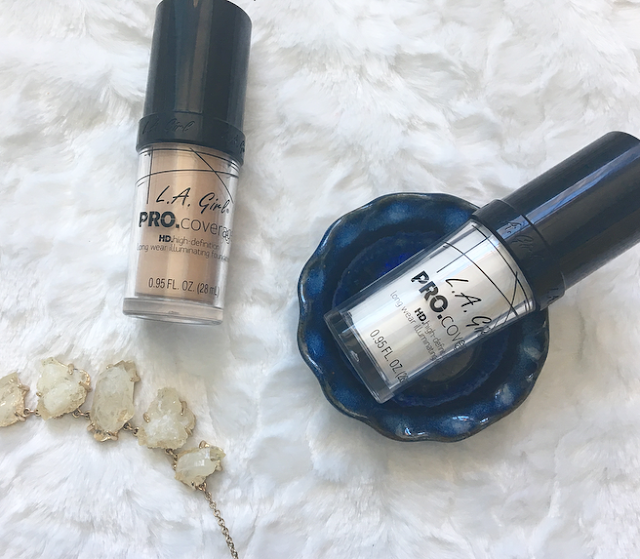 14 comments on "Review: LA Girl Pro Coverage Foundation & Mixer"
Hopefully I can get to Ulta soon, this foundation has been on my wanting the try list for ages. This is such a refreshing review to read because everywhere else and everyone else sang only high praises about the foundation. I mostly have darker shades of foundation in my collection that are only suitable for my summer tanned skin and I find it difficult to find a natural looking and lighter shade for my winter skin. Too bad this one is too dark for you. Oh this looks really interesting, I love the idea of the mixer how unique! Lovely review. Oh wow! This looks SO cool! The Mixer looks really interesting. Thank you so much for the incredible review complete with fab photographs! I really want to have a mixer, both a darker and lighter! So many of my foundations are just slightly wrong!! This one sounds amazing, not so sure about the foundation though as I don't think it'd be too great on my oily skin! I don't think the foundation would work with my oily skin! Really want to get a mixer, I have a few foundations that aren't a great shade match and it seems like such a good idea! I have never tried the foundation or any sort of mixer. I just think it can sometimes be difficult to get the mixture right. Great review! This looks great! need to get my hands on this!